My second version of the Crocus Bud shawl is finally ready (the pattern can be found here). I made it quite long so that there would be enough of it to wrap around my shoulders, and in the end it took about 1200m of yarn, that’s one and half skeins of Natural Dye Company’s 100% silk lace weight yarn. Although it has taken me quite a while to crochet it, it’s funny that I almost don’t remember doing it. That’s because the pattern is so simple I always crochet’ed it while watching tv, and I’ve obviously been so absorbed by whatever I was watching that I hardly noticed I was crocheting too. I am all for mindful crafting, and really focusing on what you are doing, for example when I am spinning, but I must admit this project definitely wasn’t an example of such mindful and meditative concentration. The yarn being 100% silk the character of the shawl is very different from the woolly version which was soft and airy, and slightly fluffy. This time, with such a crisp yarn you obviously get excellent stitch definition, and the silky yarn is very drapey too. 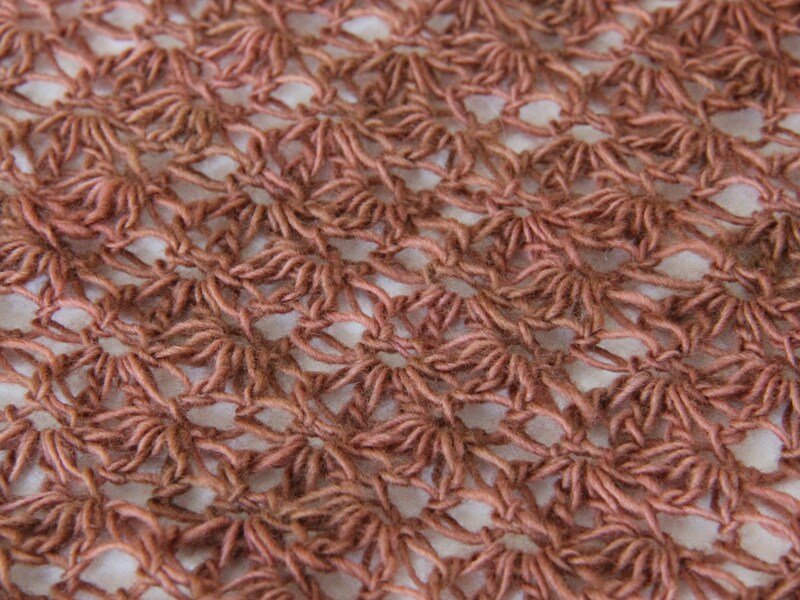 Categories: Crochet, Scarves | Tags: 100% silk lace weight yarn, crochet, crocus bud shawl, easy crochet shawl pattern, Natural Dye Company | Permalink. I am definitely a process knitter. 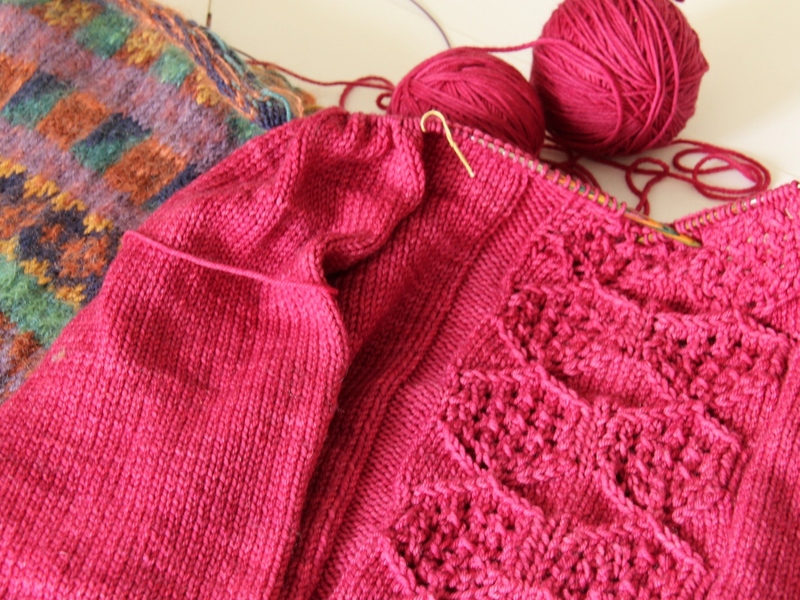 When I knit, I hardly think of the goal – the finished end product – I just knit. 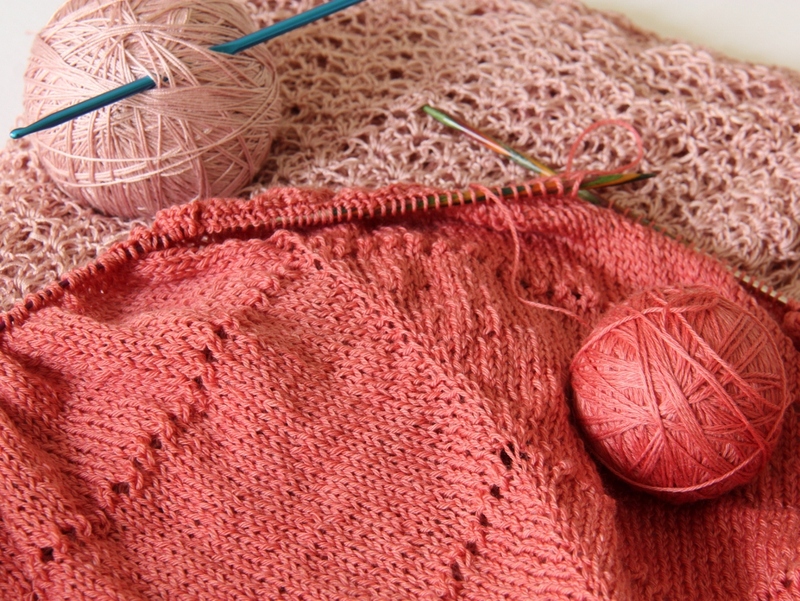 Yes it is handy to have a nice garment at the end of it, but that’s very much of secondary importance to me compared to the soothing, relaxing process of knitting. That probably explains why I always have so many knitting projects on the go at the same time, requiring different levels of thought and concentration, from which I can always pick the most suitable one for the moment. I always need at least one or two very easy projects for those moments (the majority of them I must admit) when I just want something simple for my hands to do on an auto-pilot, no thought required. Then, for the sake of having a challenge, there are some colour work or lace projects (with these I have a bad tendency to get stuck and they spend a lot of time hibernating, waiting for a suitable moment to make some progress again). 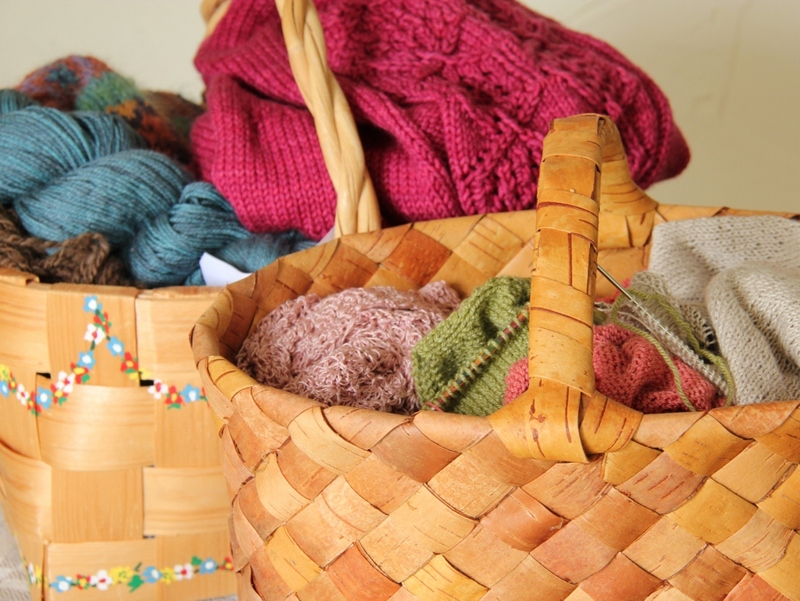 Because there are always so many works in progress, my knitting basket was getting very full. I always had to empty to whole basket on the floor to find anything in there, very frustrating as I am sure you can appreciate. A part of the problem was that at the moment I have several big bulky winter projects currently on a summer break – my never-ending Vera jumper that I have now been knitting for two years and a Vaila jumper which I started last winter and didn’t quite manage to finish before the cold season ended. And there’s the sock yarn blanket, another big bulky multi-year project. Although I hadn’t finished my winter projects by the time the sun came out, like all knitters I was compelled to start lighter summer projects in all sorts of summery colours. So I started a second version of the Crocus Bud crochet shawl and a second Clearwing jumper, knitting it this time from undyed linen (Sparrow yarn from Quince & Co in colourway Sans). These were my main projects just before my summer holiday and, I do admit, a rational knitter would have taken these projects with her when going away, just to finish them off and have a chance to actually use them before the end of the summer. But somehow a holiday doesn’t feel like a holiday unless you get to do something new and exciting, so I decided not to take the rational approach but start two new projects instead to take away with me. 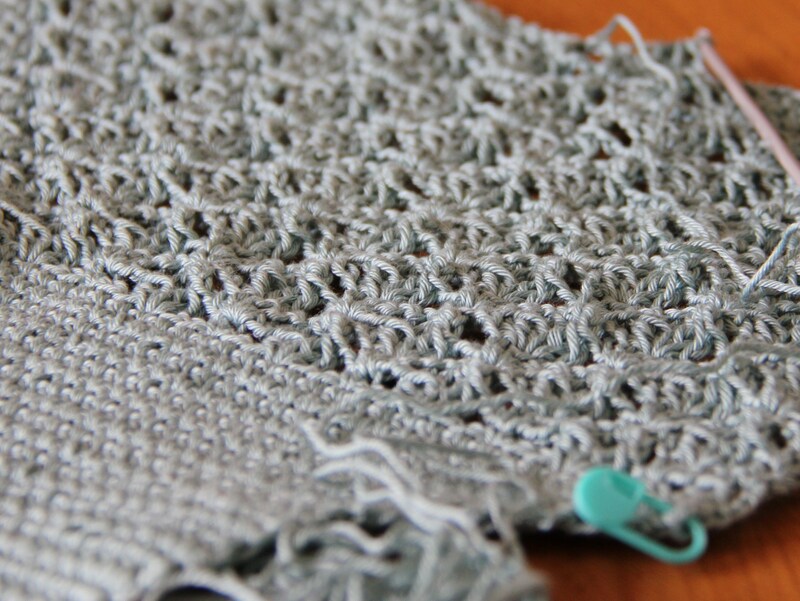 The first one was an Abigail cardi which my sister and I decided to do together as a sort of mini-Knit-Along. When my sister visited me a couple of months ago I was teaching her how to follow knitting patterns. After the visit she wanted to knit herself a cardigan but she thought she might need some extra help to interpret the instructions. So we thought it would make sense if I knitted the same pattern so that I could help with any questions she might have. We started knitting the cardigans together when I was in Finland, but she has definitely overtaken me by now and no doubt will finish hers soon. On a holiday you of course need a small easy handbag sized project that you can whip out when sitting in a cafe or a park bench. A pattern that you can just knit while watching the world go by, not having to worry about following a pattern. For this purpose I started a second version of the 3S shawl (this summer definitely has lots of second versions of great patterns being knitted). The first one I knitted for my sister from a lace yarn. This time I am using Soliloquy sock lace yarn which I am really enjoying knitting. Being a merino-silk mix it feels almost as smooth as cotton and the thickness is great for a scarf, a bit heavier than lace yarn but not too heavy, so all in all it’s an ideal yarn for a summer scarf. And mine is a lovely shade of coral, sort of orangey pink, a wonderful summer colour. At the front, the 3S shawl knitted from Soliloquy sock lace, and the Crocus Bud crochet shawl at the back. So there you are, the contents of my knitting baskets. But now I definitely have to finish at least some of them, before I am allowed to start any new projects. Categories: Crochet, Knitting | Tags: 3S scarf, Abigail cardi, Clearwing jumper, Crocus Bud crochet shawl, knitting, Quince & Co Sparrow yarn in Sans, Quince & Co Tern yarn in Seagrass, Soliloquy sock lace, Vaila jumper, Vera jumper | Permalink. 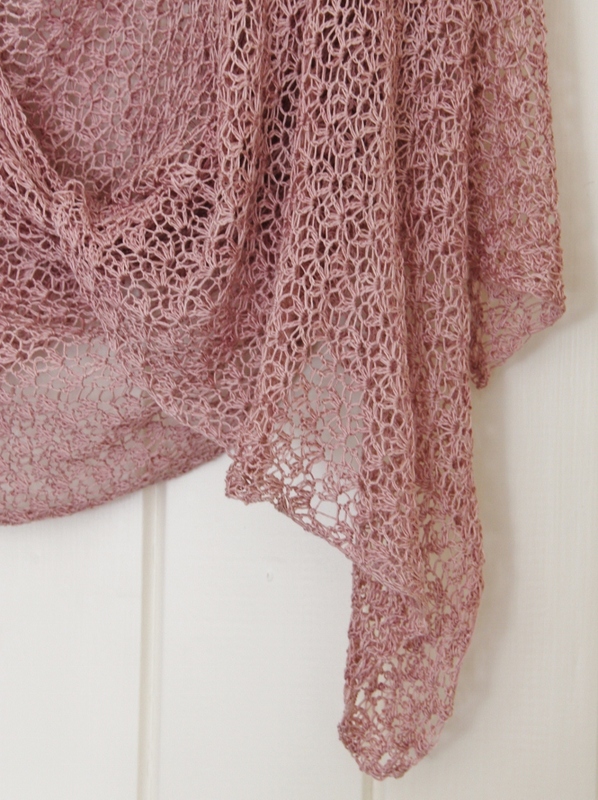 Some of you may remember the Crocus Bud shawl I crocheted last summer from Malabrigo’s Lace yarn. 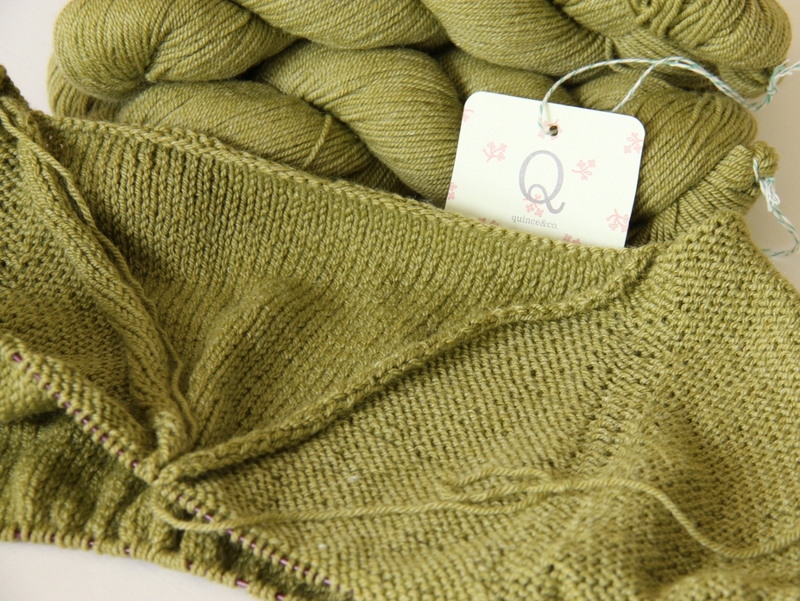 At the time, I really liked the yarn- after all who wouldn’t like baby merino wool for its lovely soft feel? The shawl was great as it went with most of my summer clothes, but after a lot of wear, unfortunately the shawl started to felt. It has shrank quite a bit, it is now a lot narrower than it used to be and the lace work is no longer very open. So for this summer I thought I’ll have another go at Crocus Bud, but this time I decided to pick a yarn that is guaranteed not to felt. In the Unravel knitting fair I found Natural Dye Company’s lace weight yarn that is 100% silk and therefore perfect for my purpose. I chose pink although it can be bit of a hit-and-miss colour – I don’t like very girlie pinks as they can be very twee or overly feminine. Pink nevertheless is a colour that happens to suit my pale North European complexion (I’m sure it was my mum who described the colour of my face as “pale gray”, not to insult me of course, I think it was just a plain observation to encourage me to buy a nice pretty red top instead of the usual black I was so into as a teenager. Anyway, I digress….). The pink of my silk yarn has a cool undertone I particularly like. It makes it a rather sophisticated grown-up kind of pink rather than a baby girl pink so it’s a good colour from that point of view too. In its simplicity the Crocus Bud is a great shawl pattern because for very little mental effort you get a nice and interesting texture which nevertheless allows the yarn and the colour to take a centre stage. 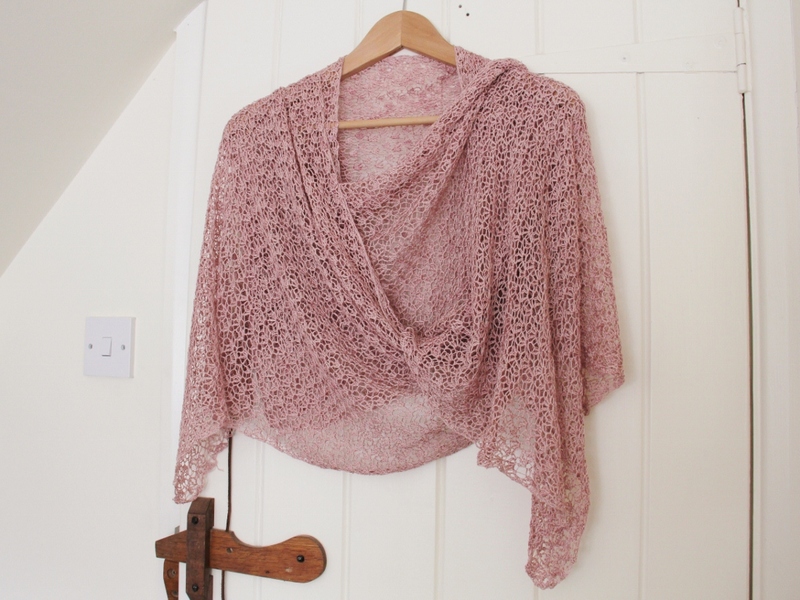 It’s not a pattern for those enviable knitters and crocheters who want a complex lace design to challenge them, rather it is an incredibly easy, repetitive pattern which makes it ideal for evenings when you’re too tired to think or want something to work on while watching the telly. Categories: Crochet, Scarves | Tags: crochet, crocus bud shawl, Malabrigo Lace, Natural Dye Company, shawl, shawl pattern, silk lace yarn, silk yarn | Permalink. 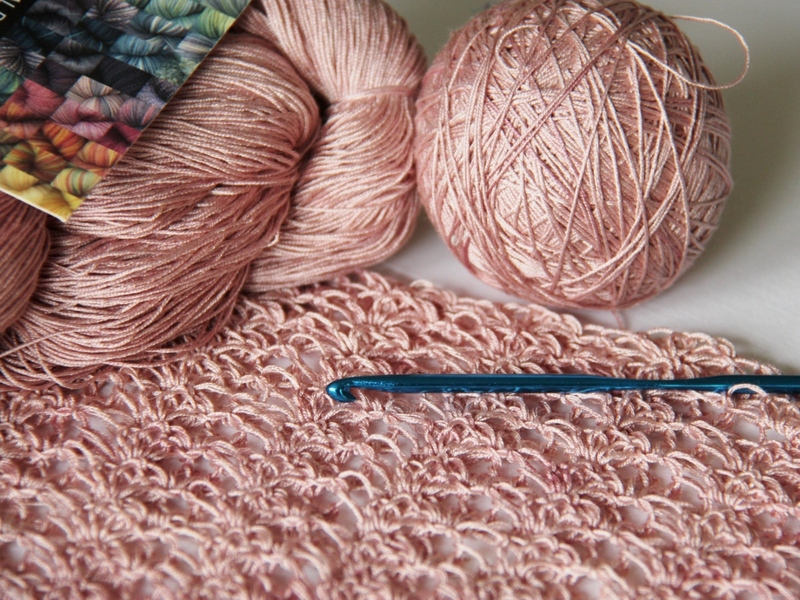 Some of you may remember me crocheting a Crocus Bud shawl a while ago. Well, I finally finished it several weeks ago, but because of the holidays I just haven’t had a chance to show you any pictures about it. It was such a great thing to have while on holiday, it’s just so practical and versatile (when it’s a bit chilly, it’s amazing what a difference it makes if you just have warm shoulders!). Already it’s has seen so much wear I’ve noticed it has started felting a little bit. Although it’s not very noticeable, it is slightly concerning. Perhaps the yarn (Malabrigo Lace) is just a bit too delicate for such heavy-use item? But whatever the cause, I’m sure the solution is to get back to work and knit more shawls so that I don’t have to wear the same one all the time! Categories: Crochet, Scarves | Tags: crochet, crocus bud shawl, Malabrigo Lace | Permalink. After the failure of my last crochet attempt, I decided to play it safe and crochet a shawl with my Malabrigo lace yarn that I bought from Eat Sleep Knit a while ago. With such beautiful yarn, you just can’t go wrong (I hope). 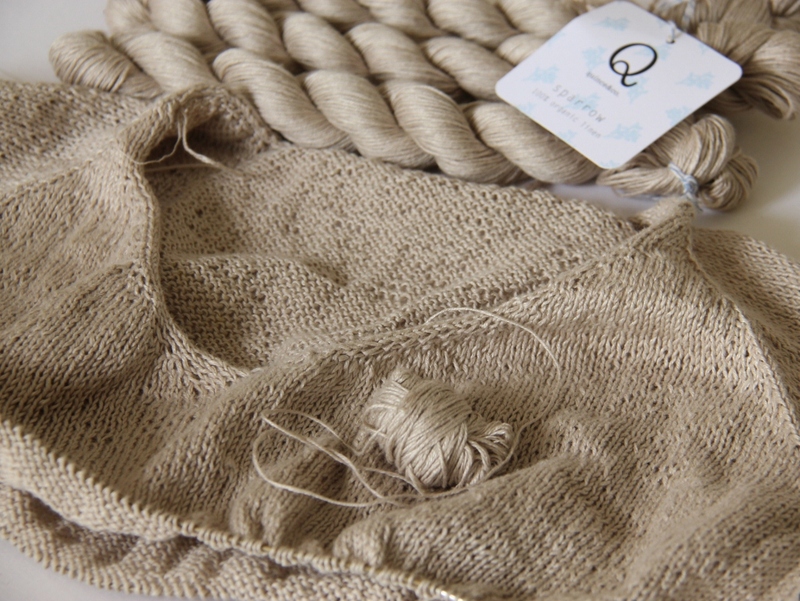 The yarn is just gorgeous, it is incredibly soft, as you would expect from 100% baby merino. The colourway is Cognac, which looked on the computer screen much lighter than it actually was. Based on the photos online I expected it to be different shades of browny dusky pink, but it turned out to be much darker, more brown than pink and more uniform in tone. But it is beautiful neverthless, so I really don’t mind (I just wish I had a well stocked local yarn shop near me…). For the pattern I chose the Crocus Bud crocheted shawl by Sharlene Boyce from Ravelry. This turned out to be a good choice, as I really like it. Given that I needed to pay for it (although not a huge quantity – $2.99), I was a bit surprised at how simple it really is. It is a pretty box standard shell crochet pattern. It has two lines but both lines are almost identical. 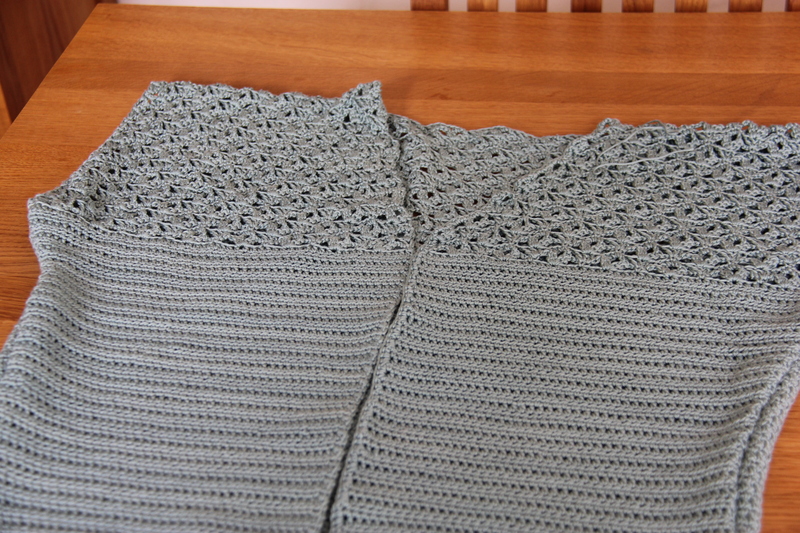 And it looks great, even before blocking, so it shows that a good design doesn’t need to be complicated. I envy those people who knit beautiful lace shawls, but I’m far too absent-minded to knit lace, so for the moment at least I am sticking to crochet which I can cope with as it is less prone to errors. This pattern shows that it really is not a “second-rate” alternative. 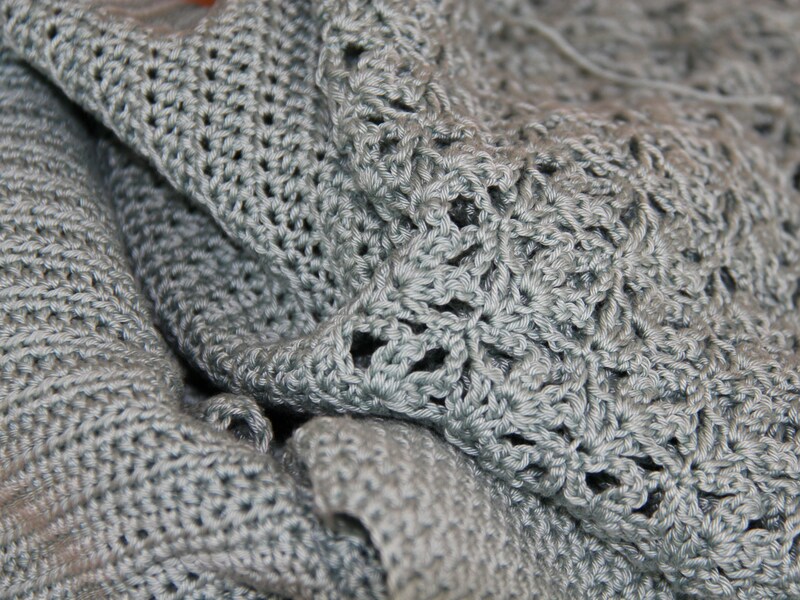 Categories: Crochet | Tags: crochet, crocus bud shawl, lace yarn, malabrigo | Permalink. I finished my crochet cardigan “Corsica” last week. Or rather, I abandoned it just before completing it. I got to the stage where I had sewed all the pieces together and tried it on. And it did not suit me at all. What a disappointment! The sleeves are quite wide, and they just don’t suit my shape at all. It looked so lovely in the picture, I though it would be great for the summer, so I am soo disappointed. This one is definitely going to be unravelled. But I have been reading such lovely crochet blogs recently that I still feel quite inspired to do some more crochet, just for a change in between all my knitting projects. I think from now I’ll concentrate on smaller projects. 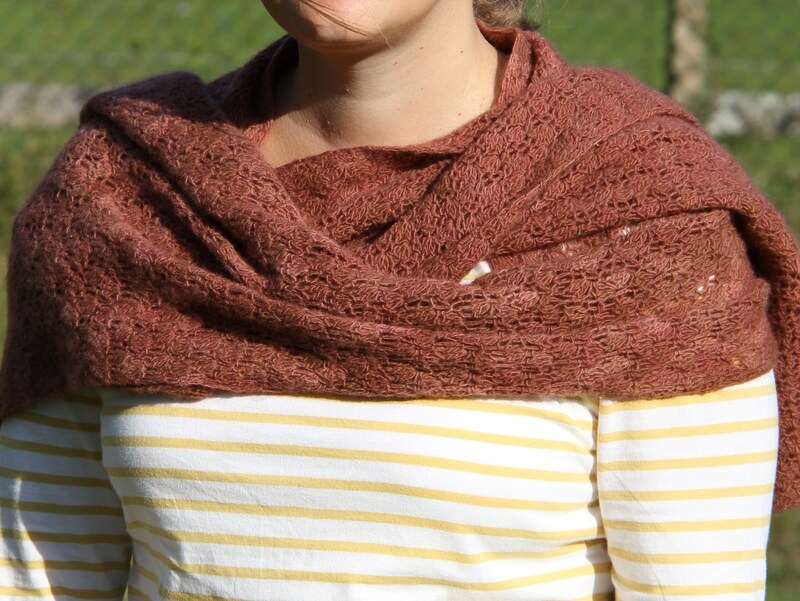 I have found a lovely pattern for a scarf on Ravelry, but that’s a topic for another post. Meanwhile, if you fancy some crochet inspiration, have a look at my Pinterest board or the beautiful blog Sew Ritzy~Titzy . Categories: Crochet | Tags: Corsica cardigan, crochet | Permalink. Although I have about three knitting projects on the go at the moment, I am still managing to make good progress with my crochet summer cardigan. 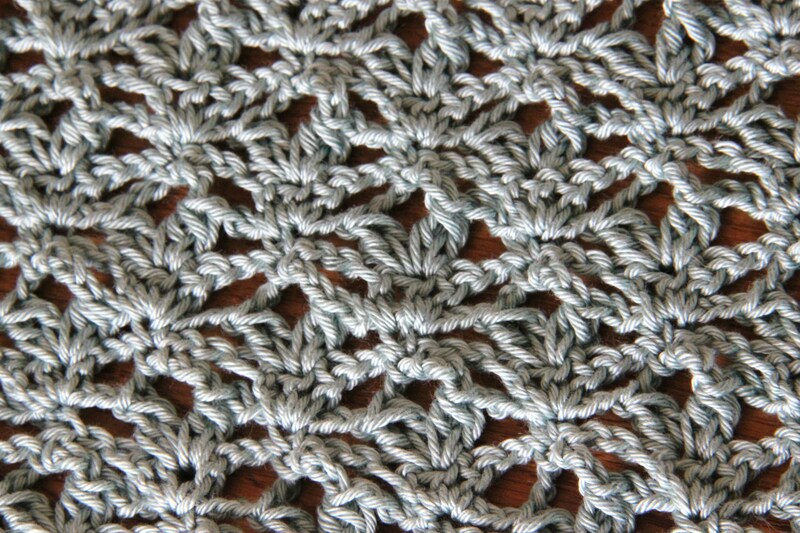 I’ve got to the lacy bit at the top and it is reminding me why I like crochet so much: with a very simple underlying pattern it is possible to create very nice textures and it is pretty quick too. This pattern only has two different rows, but the effect some how seems more complicated than that. The back piece is nearly done now so I must be almost half way through. Categories: Crochet | Tags: crochet, summer cardigan | Permalink.